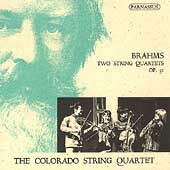 In a ten-day period in 1983, the COLORADO QUARTET made history by winning two of the music world's highest honors: the Naumburg Chamber Music Award and First Prize at the Banff International String Quartet Competition. Since that time it has been praised on four continents as one of the finest quartets of our time, cited for its musical integrity, impassioned playing and lyrical finesse. Currently based in the New York City area, the Colorado quartet appears regularly in major halls around the globe. Highlights of their career include tours of more than twenty countries, New York concerts in Carnegie Hall and on the Great Performers at Lincoln Center series, appearances at Washington DC's Kennedy Center and at the Concertgebouw in Amsterdam, and performances at festivals in Scandinavia, the Czech Republic, and at the Casals Festival in Puerto Rico. The Colorado Quartet celebrated the 1995 Béla Bartók centennial with the first complete performance of the Bartók String Quartets to take place in Philadelphia. The Quartet memmbers have been featured on radio and television worldwide, with numerous radio broadcasts in America, England and Canada, as well as television programs in The Netherlands, Norway, Puerto Rico, Peru and Mexico, Their recordings include works by Mozart, Beethoven, Brahms and contemporary composers on CD's from Fidelio, Albany Records and Parnassus Records. The Colorado Quartet is equally at home performing standard literature or newer works, and has premiered compositions by leading composers.such as Ezra Laderman and Karel Husa, as well as composers of the younger generation. They have received grants from the National Endowment for the Arts and the Aaron Copland Music Fund. The members of the Colorado Quartet are inspiring teachers, who have held residencies at Swarthmore and Skidmore Colleges, Philadelphia's New School of Music and Amhesrt College in Massachusetts. They are founders and Artistic Directors of the Soundfest Chamber Music Festival and Institute of String Quartets in Falmouth, Massachusetts. Click for the New Release!